Joseph Emmanuel “Manno” Charlemagne, Haiti’s most beloved and controversial folk singer, died in a Miami Beach hospital on Dec. 10 at the age of 69, after a struggle of several months with lung cancer which had spread to his brain. His rich baritone voice, trenchant lyrics, and graceful melodies inspired the generation of Haitians which rose up against the three-decade Duvalier dictatorship in 1986. Sometimes called the Haitian Bob Marley or Bob Dylan, Manno’s huge popularity won him Port-au-Prince’s mayor’s office in 1995, but his lyrical idealism soon dashed against the rocks of Haiti’s difficult political realities, and he was all but chased from that office. In recent years, he had withdrawn from Haiti’s political scene, except for some ill-fated sorties which he regretted. Born on Apr. 14, 1948, Manno was raised mostly by his aunt in Port-au-Prince’s Carrefour neighborhood and came of age under the brutal dictatorship of François “Papa Doc” Duvalier, who rose to power in 1957. Both his aunt and mother were singers. His father, whose identity Manno only learned from his mother in 1985, was also a musician. When Manno traveled to New York to finally meet him, he learned his father had died two months earlier. Manno in his mini-djaz period with Les Remarquables. 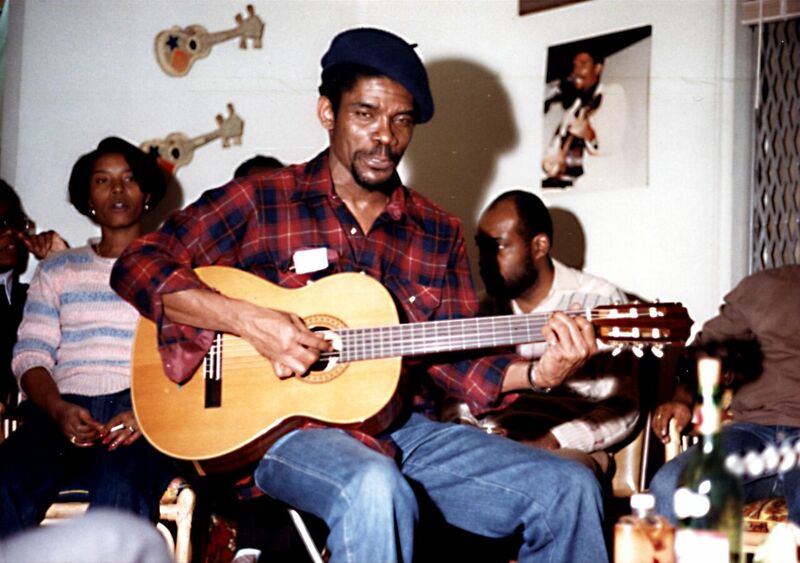 Manno, who said he was from Haiti’s “lumpen proletariat,” started playing guitar and singing at the age of 16, and in 1968, at age 20, he launched a mini-djaz called Les Remarquables. 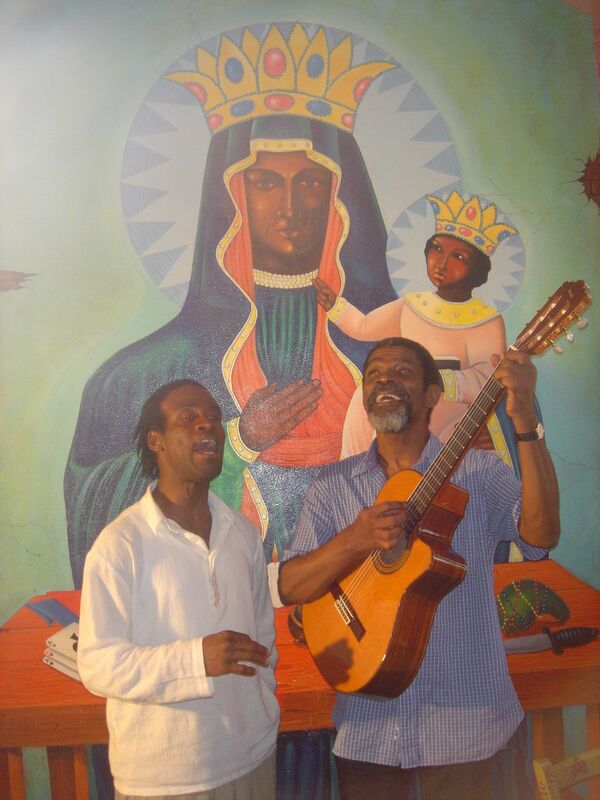 But he soon moved in the direction of the traditional twoubadou music, a form of Haitian folk song, and launched the group Les Trouvères with singer Marco Jeanty. After Papa Doc died in 1971, succeeded as “President-for-Life” by his son, Jean-Claude “Baby Doc” Duvalier, a democracy movement began to grow in Haiti. Manno wrote politically suggestive songs about the poor and exploited, among whom he’d grown up, and the duo began to sing at small underground events of students and intellectuals in the late 1970s. 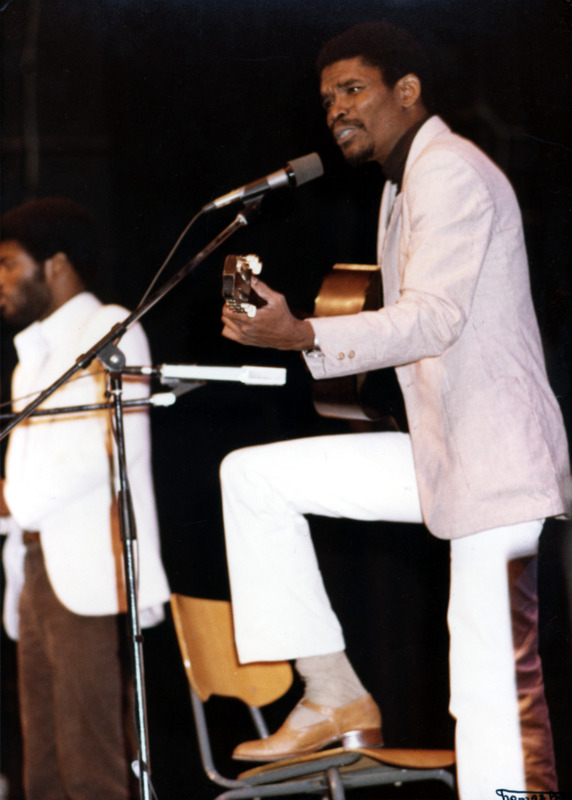 In May 1978, the duo played their angaje (politically engaged) songs on the airwaves of journalist Jean Dominique’s Radio Haiti Inter, championed by deejay and station manager Richard Brisson, who in January 1982 would be captured and killed after a failed overthrow attempt against Duvalier. The duo became a sensation, and later that year, musicologist Raoul Dénis recorded their songs which were released in an album entitled simply “Manno et Marco” by Marc Records in New York. Over the next eight years, until Baby Doc’s overthrow on Feb. 7, 1986, the album became the soundtrack for the pro-democracy movement both in Haiti and its diaspora. A young Manno Charlemagne performing to a group of young people in the late 1970s. 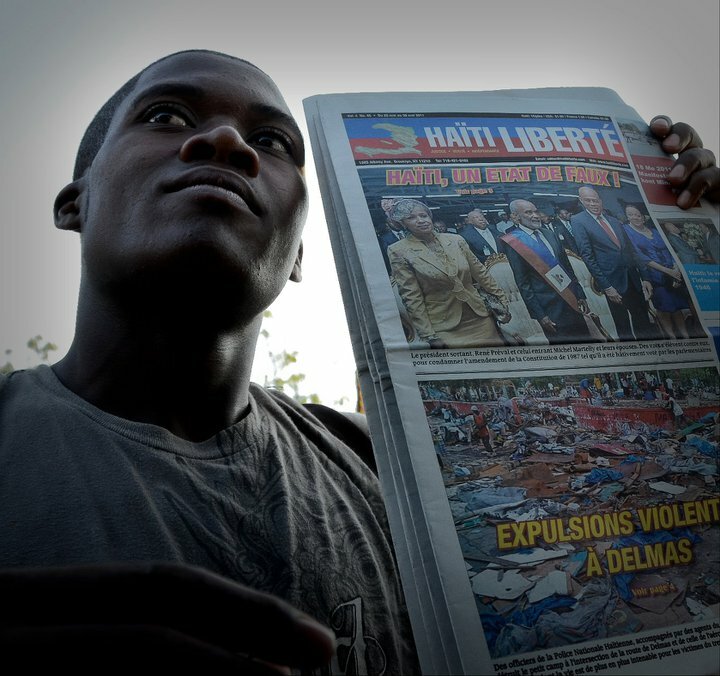 In 1980, the Duvalier regime stepped up its repression of democracy activists. Manno slipped out of a concert and sought exile in the U.S. on Jul. 4. While in Boston and New York for most of the next six years, he became a fixture at anti-Duvalierist rallies and marches. Along with composer Nikol Levy, he composed much of the music for Haiti Films’ 1983 documentary Bitter Cane, which also helped propel the anti-Duvalierist movement and Manno’s renown. During this time, he released his first solo albums, Konviksyon (1984) and Fini les Colonies! (1985) to worldwide acclaim. After Duvalier’s 1986 fall, Manno returned to Haiti and became one of the most prominent artistic and political voices of the emerging pro-democracy lavalas movement, which brought President Jean-Bertrand Aristide to power in February 1991. In 1990, Manno had released the album Òganizasyon Mondyal, which cemented his fame as Haiti’s preeminent anti-imperialist singer. A Washington-backed coup d’état in September 1991 sent Aristide into exile, and Haitian police arrested Manno at his home on Oct. 11. After Hollywood stars and Amnesty International protested, he was released a week later. Manno eventually sought refuge in Argentina’s Embassy, where a human rights delegation, headed by former U.S. Attorney General Ramsey Clark, met him in December 1991 (as depicted in the 1992 documentary Killing the Dream by Crowing Rooster Arts, which played nationally in the U.S. on PBS). After the delegation raised $3,000 for his release from the country, Manno was accorded safe passage to the airport and flew once again into exile in January 1992. During the next three years of his and Aristide’s exile, Manno traveled the world playing at demonstrations, fundraisers, and political rallies. 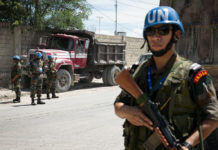 When he returned to Haiti in 1994, he successfully ran in 1995 for mayor of Port-au-Prince against Evans Paul, a former ally who had indirectly supported the 1991 coup. 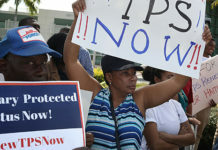 Once in Haiti’s third most important executive office (after President and Prime Minister), Manno, who had just months earlier publicly declared himself a Communist, faced many of the intractable problems of corruption, violence, and chaos that confront any Haitian politician. Although once allies, he ended up at odds with both Aristide and President René Préval. When Manno’s gun-toting deputies brutally evicted illegal vendors (mostly market women) from Port-au-Prince’s central Champ-de-Mars square, it evoked particular consternation among even his most loyal supporters. He finally stepped down from the office in 1999, a few months before the end of his term. Manno moved to Miami and dropped from view for about two years, but then in 2002, he began playing twice a week at Tap Tap Restaurant in South Beach with Richard Laguerre (bass guitar), Damas Jean-François (electric guitar), and Jocelyn Egourdet (tenor sax). The new band’s music was released on CD as Manno at Tap Tap (Crowing Rooster Arts, 2004), and the band often played to a packed house over the next 15 years. Following the 2004 coup d’état against Aristide (then serving a second term), Manno again spoke out against the coup but also made several provocatively critical remarks about Aristide (then exiled in South Africa) on Haitian radio (as was his wont), which earned him the ire of the anti-coup Lavalas masses. Manno continued to visit Haiti, mostly to form youth chorales in remote corners of the Haitian countryside, like Camp Perrin and Pignon. The sting and humiliation of his political failure and his naturally provocative style caused him to occasionally make intemperate declarations on Haitian radios, which added to his political marginalization. But it was the rise of neo-Duvalierist politician Michel Martelly which did the most damage to Manno’s reputation. 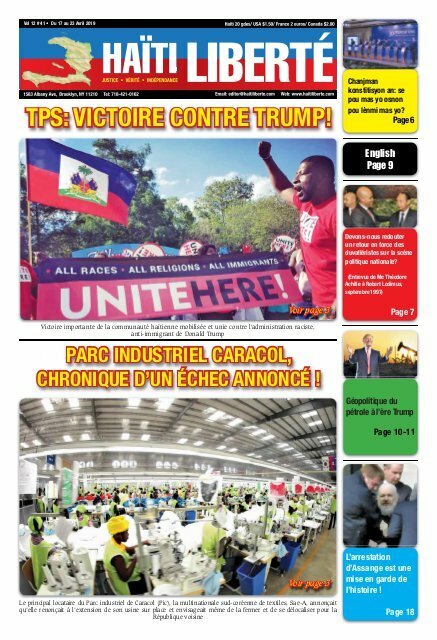 Although he had been a member of the Duvalierist paramilitary force, the Tontons Macoute, Martelly, who also grew up in Carrefour, had known and admired Manno as a youth. When he became Haiti’s President in 2010, Martelly courted Manno, giving him an office and a salary as an “advisor” in the National Palace. Citing outrageous corruption, Manno eventually quit the job but remained on cordial terms with his “friend” and fellow musician “Sweet Micky” Martelly, even as popular rage against the latter grew. Following controversial October 2015 elections, Manno agreed to serve on an investigative commission convened by Martelly, although it was generally viewed as a rubber-stamp body. Following that final foray into politics, which provoked great dismay among many, he returned to Miami, where he resumed his biweekly performances at Tap Tap. Last year, Manno was diagnosed with and began treatment for a fungal lung infection, which affects many Haitians who have had tuberculosis. 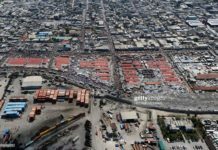 He visited Haiti in the summer, during which time President Jovenel Moïse’s officials tried to entice him, with money and favors, to participate in the government’s “Caravan for Change,” a sort of traveling political circus. Manno refused. In late July, Manno began to have dizzy spells and speech problems. Fearing a stroke, he quickly returned to Mt. Sinai Hospital in Miami Beach, where doctors found a huge malignant tumor in his brain which had mestastacized from cancer in his lungs. On Jul. 31, he underwent a successful 10-hour operation to remove most of the tumor, but it was followed by grueling radiation and chemotherapy sessions, which left him weak. In early November, Manno suffered several seizures and strokes, which sent him first back to Mt. Sinai Medical Center, and then, briefly, the Miami Jewish Health Systems nursing home in Miami’s Little Haiti. Just after Thanksgiving, he developed a high fever and was rushed from the nursing home to Mt. Sinai, where they discovered he had a pulmonary embolism. Doctors were unable to dissolve it, and the cancer in his lungs and brain continued its inexorable march. In the final three days of his life, he was mostly unconscious, with the hospital providing only palliative care: an oxygen mask and heavy doses of morphine to ease his pain. He finally died shortly after 4:00 a.m. on Sun., Dec. 10. Although expected, the news of his death sent a shock-wave through Haitian communities for which Manno had been a symbol of resistance to the Duvalier dictatorship, and an authentic voice and representative of Haitian popular culture, critical of U.S. imperialism and its misdeeds both in Haiti and around the world. 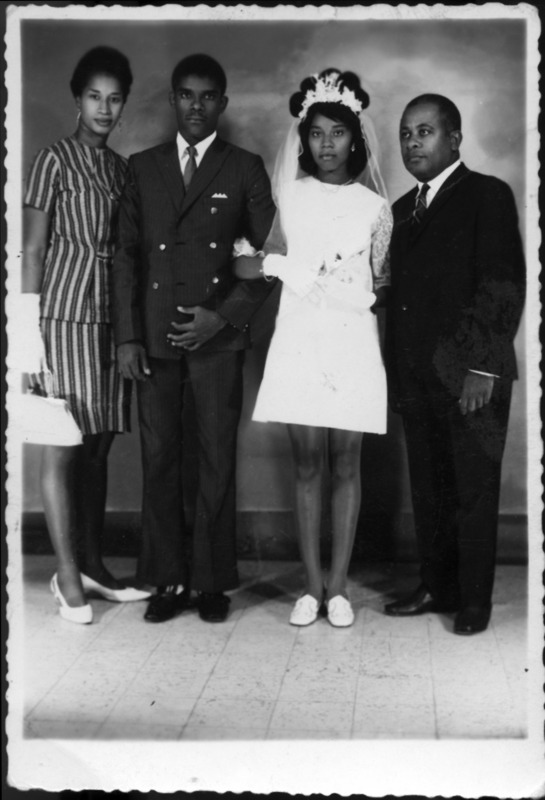 Manno Charlemagne’s wedding photo in Haiti in the 1970s. There are several books about the musician, including Manno Charlemagne: 30 Years of Songs published by Fondation Connaissance & Liberté (FOKAL, 2006) , and Nicole Augereau’s graphic comic book Quand viennent les bêtes sauvages published in 2016. Among the films about him are Frantz Voltaire’s Konviksyon (2011) and Dans La Gueule du Crocodile (1998) by Canadians Catherine Larivain and Lucie Ouimet. The last album of his music, entitled Les Inédits de Manno Charlemagne (The Unpublished Songs of Manno Charlemagne), was released in 2006. After a private viewing for his family, there will be a public viewing of Manno’s body on Thu., Dec. 14 at 5:30 p.m. at Notre Dame d’Haïti Catholic Church on 62nd Street in Miami’s Little Haiti. Although Manno was a devout atheist, there will then be a funeral mass at 7:30 p.m.. His body will be flown to Haiti on Sat., Dec. 16 and exposed on Tue., Dec. 19 at the Museum of the Haitian National Pantheon (MUPANAH) on Port-au-Prince’s Champ-de-Mars. The funeral is scheduled to take place on Fri., Dec. 22. Meanwhile, in Brooklyn, the community group KAKOLA and Haïti Liberté are organizing a traditional veye patriyotik (patriotic wake) to pay homage to Manno on Fri., Dec. 15 from 7-11 p.m. at Haïti Liberté, 1583 Albany Avenue, Brooklyn, NY. At the same time in Miami, former friends, comrades, and associates will be holding a similar tribute at the Little Haiti Cultural Center on NE 2nd Avenue. 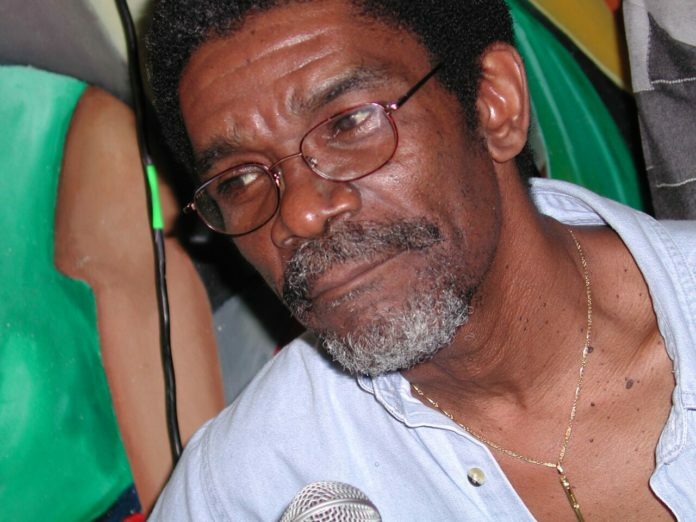 Although his final years were compromised by political missteps, unseemly associations, and outbursts, Manno Charlemagne earned a permanent place in the hearts and memories of the Haitian people for his revolutionary, anti-imperialist, and pro-democracy songs of the 1970s, 80s, and 90s. C’est fini les colonies, fini le temps de mépris. Ça va changer un jour, ça va changer bientôt, ça va changer un jour! It’s over, the colonies, no longer the time of contempt. It will change one day, it will change soon, it will change one day! One must really struggle for things to change.